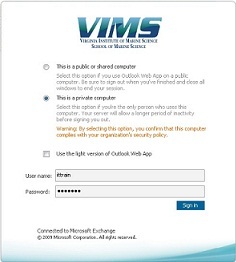 The Outlook Web App (OWA) Service (email.vims.edu) provides a means of connecting to your email account remotely using your web browser. The browser you use to access the service will affect the features you will be able to access. Users of OWA who are not able to use one of the supported browsers (Internet Explorer 7, Safari 3, and Firefox 3) may use the Light version of the OWA client. This has fewer features and different views of your email account information, for example only a single day can be viewed on your calendar and public folders are not available. a. "This is a public or shared computer" - Important: Use this option if you are accessing OWA from a public or shared computer; such as in a library, lab, kiosk, or another public location. b. "This is a private computer" - Use this option if you are the only person using the computer. By selecting this option, you confirm that this computer complies with the security policies at VIMS. 3. Select "Use the light version of Outlook Web App" if you are on a slow dialup or low band-width connection. Otherwise, you will utilize the premier version of OWA. *Important: Whenyou have finished using OWA remember to sign out. An OWA Learning Lab will be offered the day after we Go Live. The OWA Learning Lab will be held in the Watermen's Hall Student Lab on March 11th from 10 a.m. until noon and again at 2 p.m. until 4 p.m.
You are welcome to come in during these times in order to try out the system and ask questions. This is a free form, unstructured session to use OWA. To help you learn as you go we have created create sheets that are short descriptions of how to navigate the most commonly used features of OWA. We have also created short show & tell video clips describing the most common features. As interest in learning additional features is expressed, we will create new cheat sheets and show & tell video clips.